I’m really pleased to be back in the New York Times today! 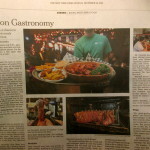 The article is in the Metropolitan section, on the NJ Dining page. Timed to upcoming bowl games, etc., I visited eateries in north, central, and south Jersey looking for great takeout options.